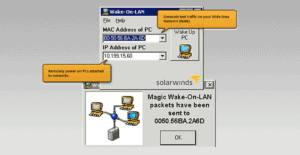 There are lots of Wake-On-Lan options but you can never really go wrong with a SolarWinds product. 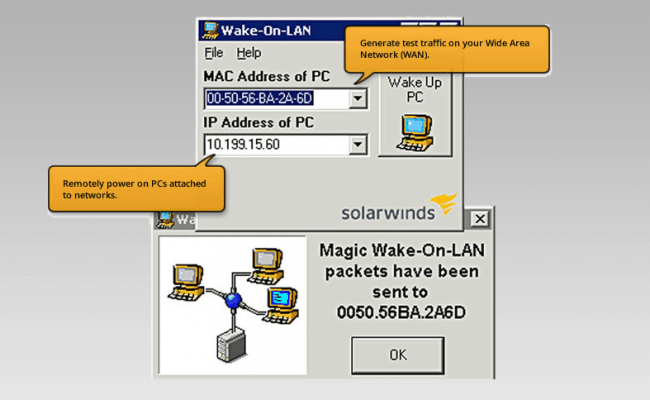 When it comes to Wake-On-Lan products, less is more and this Free SolarWinds Wake-On-Lan tool does just what you need, no more, no less. The program sends a “magic packet” to the target machine on a network, letting it know it’s time to wake up. If the WOL feature is enabled in the BIOS, the system will startup as if someone pressed the power button. Target systems include a NIC that supports Wake on LAN. Wake on LAN is enabled in the BIOS. Patch Manager can connect to the target systems using a UDP broadcast. 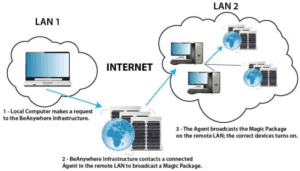 You set up Wake on LAN in the Patch Manager Administrator Console to collect the MAC address of all targeted systems on one or more subnets.